After all the hype and anticipation the Olympic Games are finally underway. To celebrate many knitters are participating in the Ravellenic Games. While this would be a good way to set some knitting goals for myself, I don't feel like taking on another commitment right now. I have a long list of new booth samples to knit, but I have a lot of other work that needs my immediate attention. Unfortunately that work doesn't include hours and hours of uninterrupted knitting time. But then I got to thinking - and this is usually where I get into trouble - why not at least start a new project to mark the occasion of the Summer Olympics. If I start a new booth sample, I could chip away at that long list. As if I needed another excuse, my on-the-go knitting project is almost finished and I need a new one. Scalene. 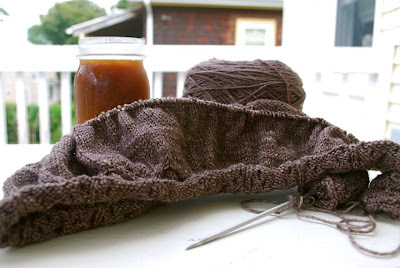 Cozy, comforting garter stitch - the kind of knitting you can settle down with for "just a few rows" and lose 3 hours in the process. It's always interesting to see which obscure sports achieve Olympic status. How about sheep shearing? If the trampoline can make it, maybe sheep shearing isn't too far behind. Usually I have a knitting project in progress at my desk. It keeps me occupied when I'm on the phone. It seems I spend more time on hold than I spend actually talking with people. A knitting project can be a good distraction from bad background music. Or sometimes I'm trying to wade through email, but the words aren't flowing. I take a 15 minute break with a bit of knitting and get back to work with a fresh perspective. The other day I needed to start a new desk project. I could start another sock. Socks are always good, but I've been feeling a hat binge coming on. I decided to explore that option and came up with this. Not only did I find a hat, I found a hat KAL - the Rhinebeck 2012 Hat KAL (Ravelry link). Perfect. A pattern given out in measured doses. That way when I pick up my desk project, I don't get sucked into hours and hours of knitting. This little strip is the brim - 15 stitches worked back and forth. As a bonus this hat will match the Rhinebeck Mittens I made last month. 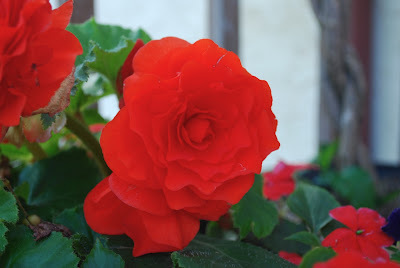 I don't think I'll ever tire of the red and green color combination, especially the way Mother Nature does it. My color inspiration for the week. Sometimes a knitting project can test your endurance and patience. You've completed the most time-consuming, complicated part of the project and are on the home stretch. But don't get too comfortable and settle in for a smooth ride to the finish line because that's just an invitation for something to go awry. 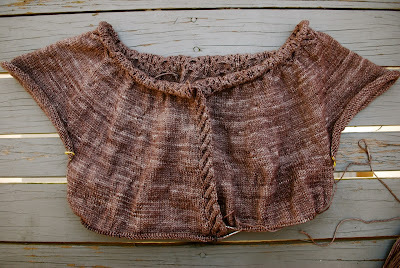 Over the weekend I finished the body and bottom border of Alys, and I cast off. The end was in sight - knit the sleeves and I'd be done. Simple stockinette sleeves with a bit of a cabled border at the cuff. Bracelet length sleeves - short and sweet. I picked up the first sleeve and started working in the round. The rest of the sweater had been knit flat. In the back of my mind - the way, way back - I had a thought that often my gauge in the round can differ from my gauge working flat. I should have tuned in and listened to that thought. After knitting a couple of inches I noticed that my sleeve gauge was slightly different from the rest of the sweater. It was late in the day, so I put the sweater aside and picked up a sock. The next day I looked at the sleeve again. If I didn't point out the gauge difference, no one would ever notice. I didn't spend much time trying to convince myself. The sleeve bothered me, and I couldn't live with it. I ripped it out, changed needles and started over. Now, finally, I'm on course. After that delay I'm sprinting to the finish line. 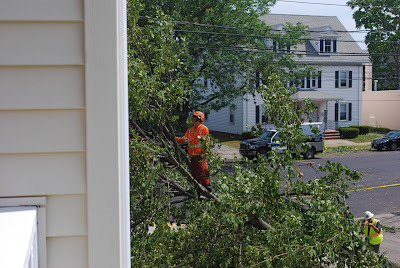 In the aftermath of the intense storm that hit us last week we were left without internet service for a couple of days. It took me a while to adjust to the fact that I couldn't sit down at my desk and plug into all the latest. In the grand scheme of things being without internet wasn't such a bad thing. After all we still had power so the fridge wasn't a lab for all kinds of stinky science experiments. Being without internet meant I had more time for other things, especially knitting. To keep the peace I also did some cooking. On one hand I was almost sad to have internet service restored. I could get used to sitting on the porch and knitting. On the other hand now I have a bigger mountain of work because I was offline. 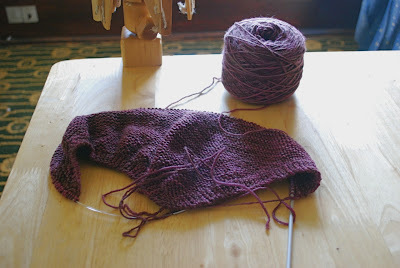 I have knitting progress to share, but it will have to wait for another day when I have pictures. 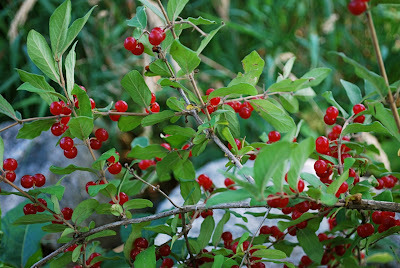 Instead today I have a few tidbits of . 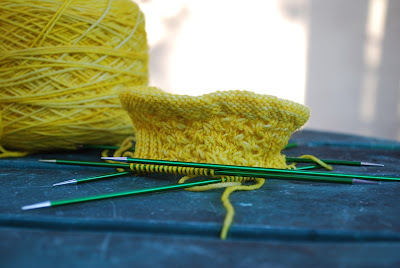 . .
~ Last week a couple of knitters and I were discussing knitting in public, specifically meeting situations. 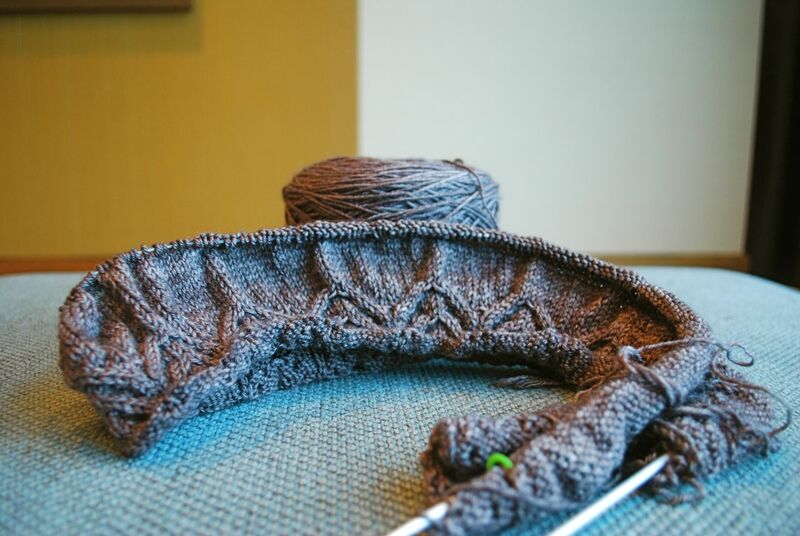 The consensus was that it's harder to knit during smaller meetings where more eyes are focused on you, but that for larger meetings and conferences no one really pays attention. Along those same lines consider sporting events. You wouldn't think that knitting at a large sporting event would draw much attention, but it appears that one knitter raised a few eyebrows by knitting at Wimbledon. You can read the details and one writer's perspective here. I think this writer summed it up when he said, "The tennis family, it seems, is willing to indulge the nutters but not the knitters." ~ One of the benefits of these tough economic times is that people are becoming more thrifty and creative. To keep her wedding costs down this yarn shop owner and bride knit her own wedding dress. Her best advice on knitting her own dress? "Just make sure you leave yourself plenty of time." ~ In yarn bombing news check out this colorful, crocheted crocodile playground. I can't imagine how much time it must have taken to make this huge croc, but it has me thinking. Maybe something on a smaller scale . . . I've been thinking a lot about sweaters lately. There's the sweater I'm working on, and a recently finished booth sample sweater. 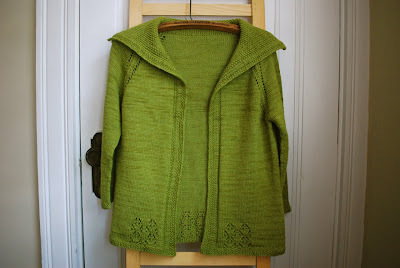 This is a wonderfully versatile sweater that includes a seed stitch collar and trim. And there's a touch of lace along the bottom with this motif. The yarn is Dirty Water DyeWorks Edna, colorway Celery. Edna is a Polwarth wool / silk blend and makes a wonderful sweater. I'm already considering other sweater patterns for Edna. When we're in the middle of summer, sweater weather seems so far away but it will be here soon. 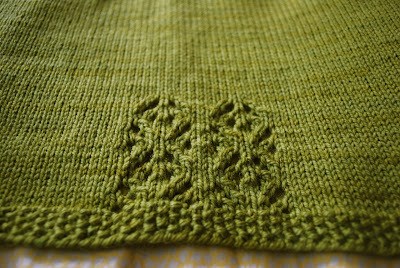 As it so happens Allyson from Holla Knits is using Edna in the same colorway. Keep an eye on her blog for another fun design. Mother Nature brought a bit of excitement to our neighborhood the other day. 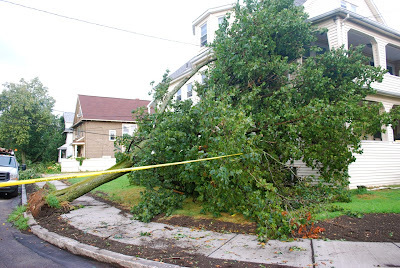 A microburst moved through the area and uprooted numerous trees along the way. This one landed on the corner of our house. Surprisingly there wasn't any damage to the house. 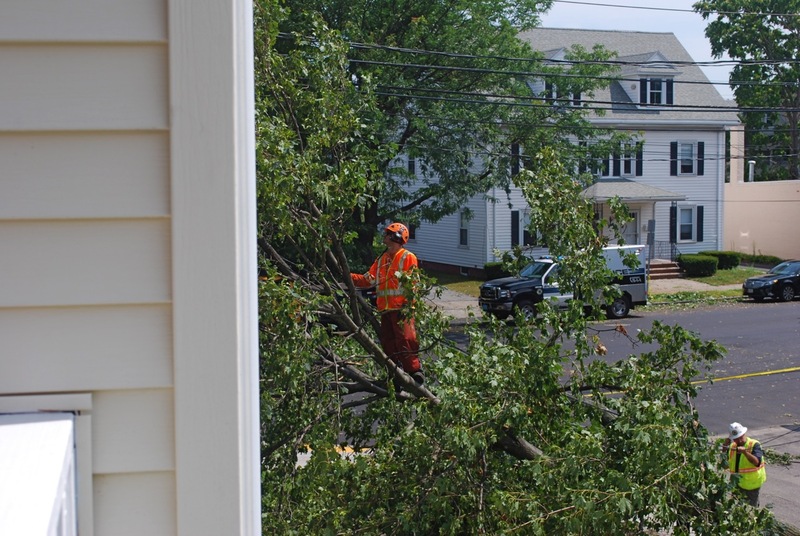 Streets were closed to traffic and cleanup crews worked through the night. 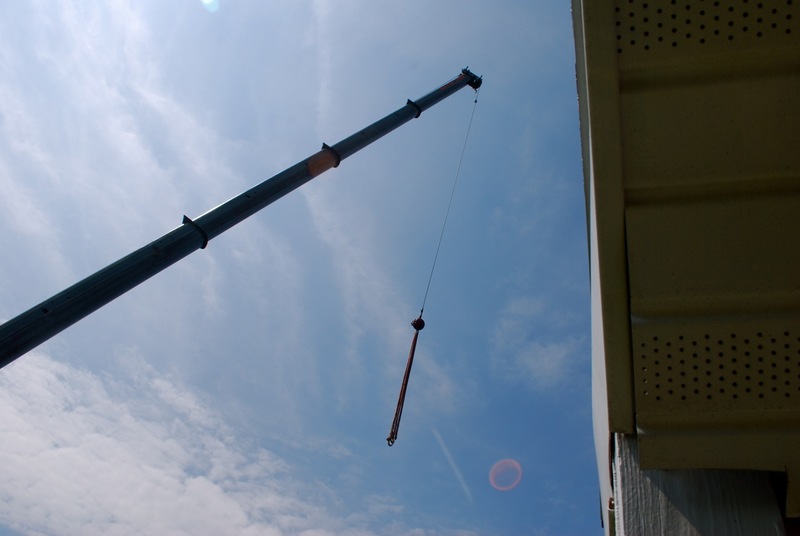 In the morning a big crane moved into action. 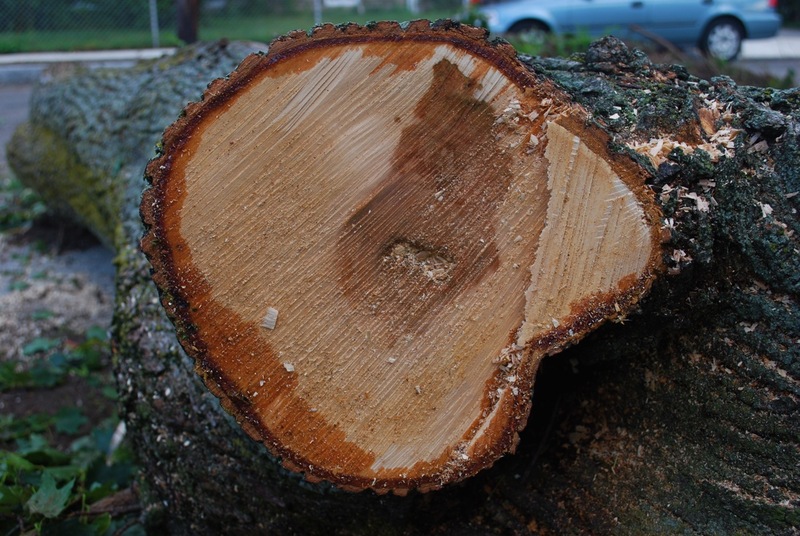 First they cut the tree into smaller pieces. Then they lifted the pieces away from the side of the house with a cable and hooks on the end of the crane. The whole process took half an hour or less. 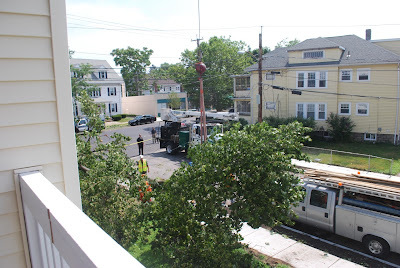 When they were finished with our tree, they moved down the street to the next house. All of the streets are open again, but the cleanup process continues. The storm provided my color inspiration for the week - shades ranging from brown to tan. We've had a hot summer. I know New England isn't the only hot spot on the map. Many places are experiencing extreme weather conditions. Normally I don't let the HHH (hazy, hot and humid) interfere with my knitting, but yesterday almost pushed me over the edge. I can take a few days of uncomfortably hot weather, but this summer it seems we've had more than usual. For the last week my knitting has been focused on Alys. I'm been on a mission and want to finish in the worst way. I compiled a list of new samples the other day - there's no time to waste. I've been knitting in front of a fan, steadily moving closer to the bottom border. 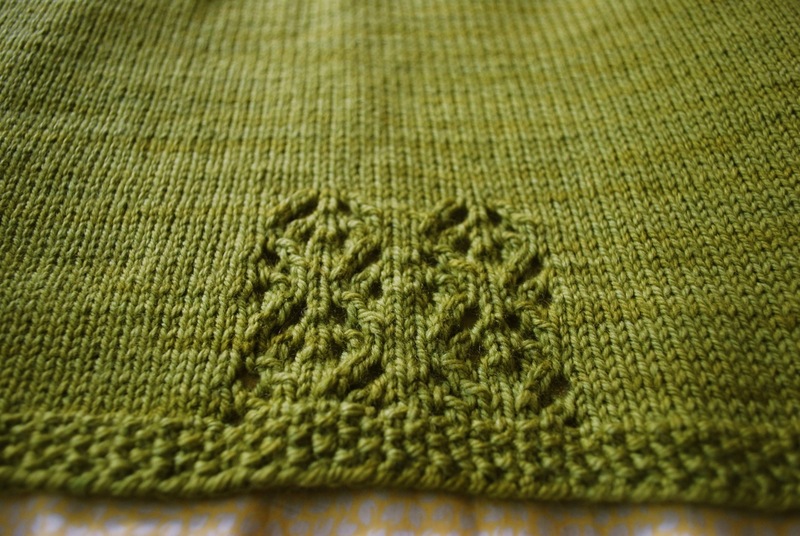 Alys must come off the needles. But yesterday I snapped. It was another day of oppressive heat combined with errands that involved waiting time precious knitting time, but I couldn't bring myself to lug Alys along for the ride. This sweater has become cumbersome, heavy and hot. Instead of adding to the steamy conditions with a lap full of wool, I opted for a sock. At first I felt a twinge of guilt for abandoning the sweater, and then I felt a sense of relief. Sock knitting is so much cooler. Not to mention the fact that rounds with 65 stitches move at lightning speed compared to rows with over 300 stitches. To take matters even further I started to consider the difference between the two projects. The sweater is obviously larger and heavier than the sock, but how much? To answer that question I pulled out the scale. The sweater weighs in at 271g, and the sock weighs in at 57g . . . a cool 57g. 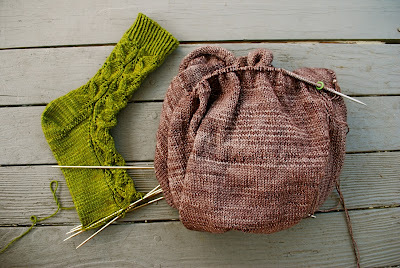 With more HHH today I'll be finishing the toe and casting on the second sock. Alys won't be forgotten. This weather pattern is supposed to break later today, and Alys will be back in action tomorrow. 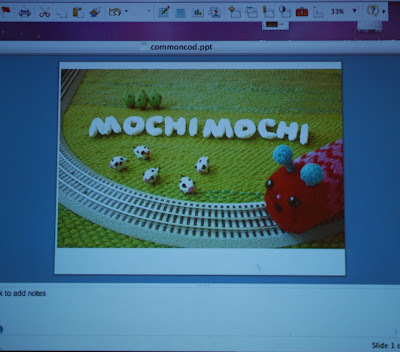 Friday night I attended my fiber guild meeting to hear Anna Hrachovec talk about knitting toys. I haven't knit many toys, so it was interesting to hear someone who is obsessed with knitting toys tell her story. Anna is the creator of Mochimochi Land, a magical world full of knitted toys. 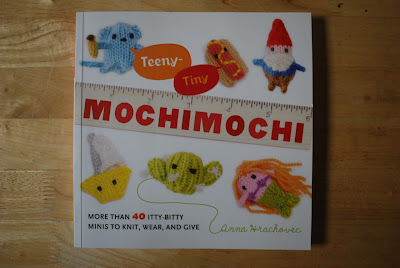 The story of how Anna came to knit toys is interesting. Anna was a high school foreign exchange student in Japan. While she was in Japan, she learned how to knit. In Japan Anna was exposed to a culture that includes kids' toys for adults - many cute, toylike objects meant for adults. This spirit of playfulness made an impression on her. Anna continued to knit after she came back to the States and started to knit small objects and toys. She embroidered eyes on her little objects and realized they could look back at her. She was hooked. Anna kept a blog and posted about her little toys. One thing led to another. Before she knew it, she had two books to her name and she had quit her day job. These days all of her knitting time is spent on toys. She knits toys and only toys. Anna uses knitting to explore many things, some of them strange. There are no boundaries. When knitting tiny, Anna scales the object down to the essential elements. Often she takes something familiar and makes it cute - for example, the knitted toilet complete with plunger. In addition to her toys Anna has knit fiber art sculptures and has had several art installations. She also has a new book coming out in the fall. 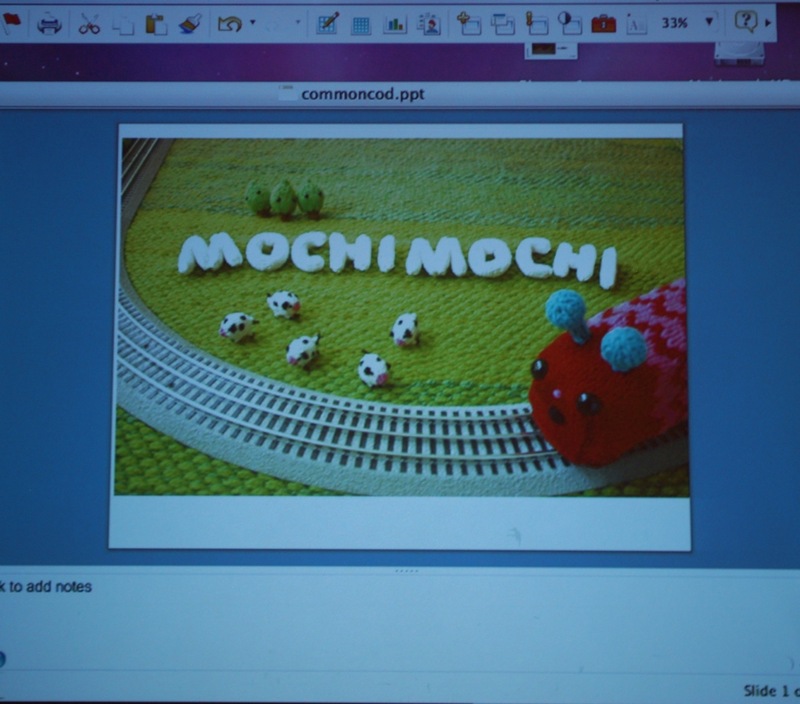 It was an entertaining, informative guild meeting with a glimpse into the world of knitted toys. The summer months can be a good time for many things - from gardening to cleaning out the garage to de-cluttering the house. I should be more virtuous and tackle some of those household projects, but I'm not. Instead I look forward to the less-scheduled days of summer to catch up on my reading. During the rest of the year I'm always putting books and magazines aside to read later. The problem is I never make time to read, and the pile just grows and grows. By the time summer rolls around I have a mountain of books. This is one stack I'm working on. I've placed piles strategically throughout the house to increase my odds of getting through them. 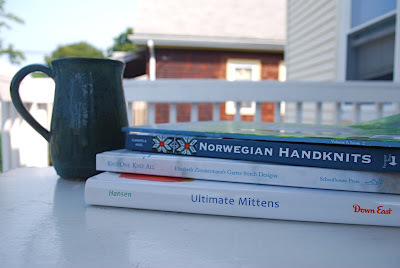 Knitting books are good summer reading because most of them don't have to be read from cover to cover, and they usually have a lot of pictures. They're easy to pick up and put down. 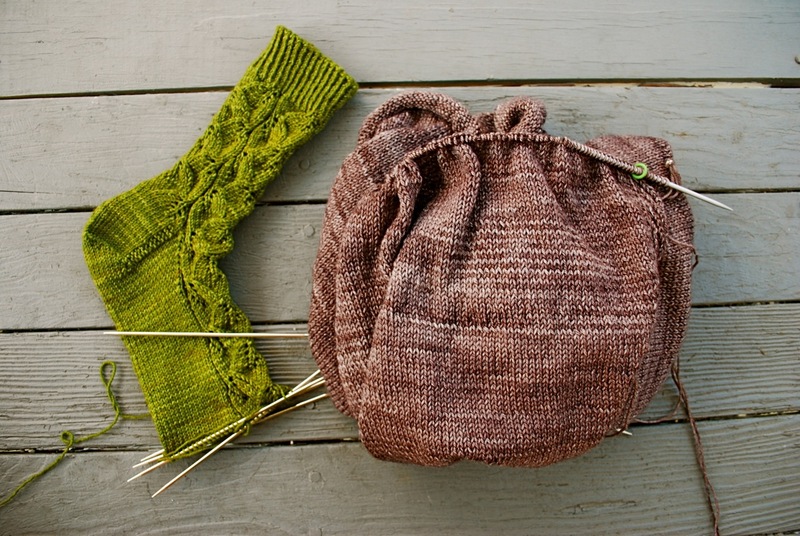 If you're looking for new reading material, check out The Sock Report from Janel Laidman. This magazine is all about sock yarn and features patterns - not just sock patterns - using sock yarn. It's available in either the online version or in print from your local yarn shop. Some colors stand out and grab your attention. That's what my color inspiration for the week did. It's that time of year. People are on vacation, and the work world has slowed down. It can be challenging for those of us who are trying to work. Replies to email and voicemail take longer. It's the waiting game - waiting for a much-needed response, waiting for more information. Some days I feel I'm working at a turtle's pace, and forward progress is a lofty goal. Yesterday even the mailman didn't deliver. The only ones getting real work done are the construction workers who are working on my street. And they remind me of this fact every morning at 6:30. Since stalking my inbox isn't productive, I've been working on Alys. 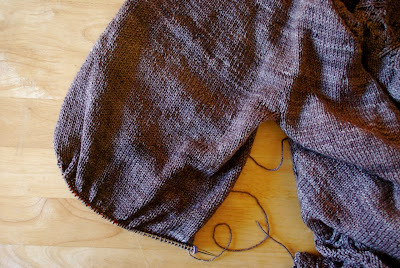 Now that I've set aside the stitches for the sleeves, the rows seem to be zipping right along. I'm ignoring the fact that I'll have to deal with those sleeve stitches later. At least I'm making progress on something. 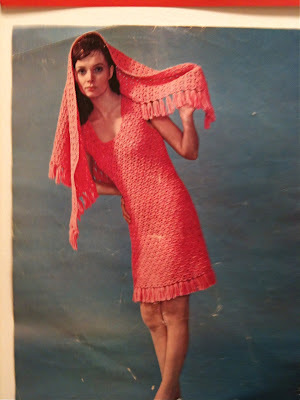 Last week a friend was de-cluttering and getting rid of knitting patterns. I helped her out and took a few of the patterns. I have a couple of projects in the works already, so there wasn't an immediate need for something new. But it's always nice to have fresh ideas and inspiration ready and waiting. You never know when the need may arise. The patterns hung out on my desk for a only a day or so before one of them called out for attention. Fall is just around the corner and I have other projects I should be working on, but my resistance was low. All I needed was the mere suggestion of a new project, and I was off and running. Of course I found justification for starting a new project. 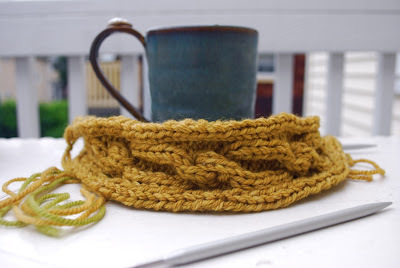 This colorway, Lucia Mustard Seed, is seasonally appropriate - it screams summertime sun. And the sock is an ankle sock so it's not much of a time commitment, right? I'm traveling again, and yesterday I had a minor knitting needle emergency. Where are all my 2.00mm DPNs when I need them? Lucky for me there was a yarn shop in the area. I ducked into Borealis Yarns in St. Paul. They had the needles I needed and so much more. They have an ample work table in the front and several rooms with a large selection of yarn. The space is comfortable and inviting; the staff is friendly and helpful. The fun part of this shop is the bathroom. 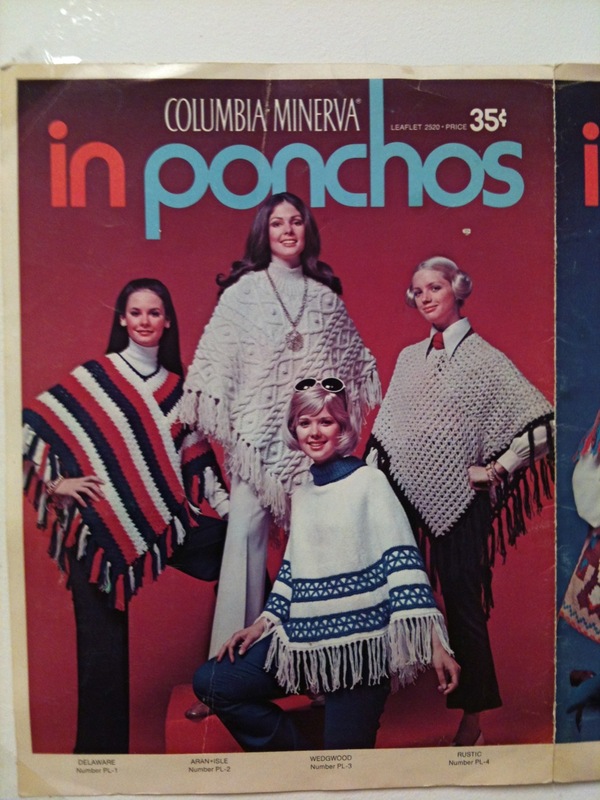 The walls are decorated with covers from vintage knitting patterns. I have my own collection of vintage knitting patterns so I really appreciated the display. I thought this one was especially charming. If you're ever in the Twin Cities, be sure to check out Borealis. I've been working away on Alys. It looks the same as the last time I posted only larger, so I'll spare you the photo this time. 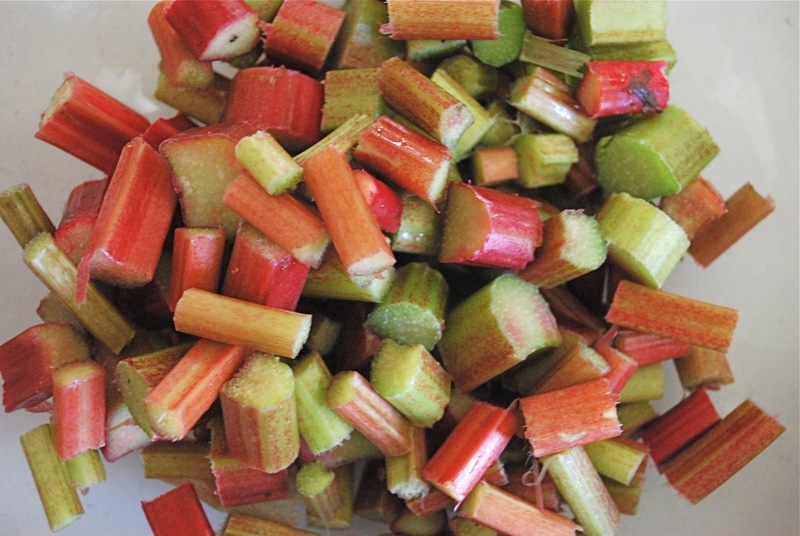 The rhubarb season has come and gone all too quickly, but I snapped this shot from one of our last batches - my color inspiration for the week. Crisp green tinged with pink. Some holidays are full of expectations that require weeks of planning, and some holidays are laid back and require minimal effort. Lucky for me today is one of those easy, relaxed holidays. I've been on the go so much the past couple of weeks that Independence Day snuck up on me. This is a regular work week for me, but for many people it's a vacation week. Today I'll go with the flow and take it easy. Tomorrow I'm back to work. For those who celebrate, enjoy the holiday. I'm always knitting in public, and sometimes it leads to interesting conversations. Over the weekend I was knitting in a convention center. The place was packed with people. I had time to kill so I found a comfy chair and pulled out my knitting. It wasn't long before a woman and a couple of kids settled into the chairs nearby. The woman noticed my knitting - what was I making etc. She was a quilter, so we discussed that for a bit. In our discussion the woman commented that you really don't see people knitting any more. Her remark took me by surprise. Was she serious? Didn't she know about sheep and wool festivals, Sock Summit, Ravelry. 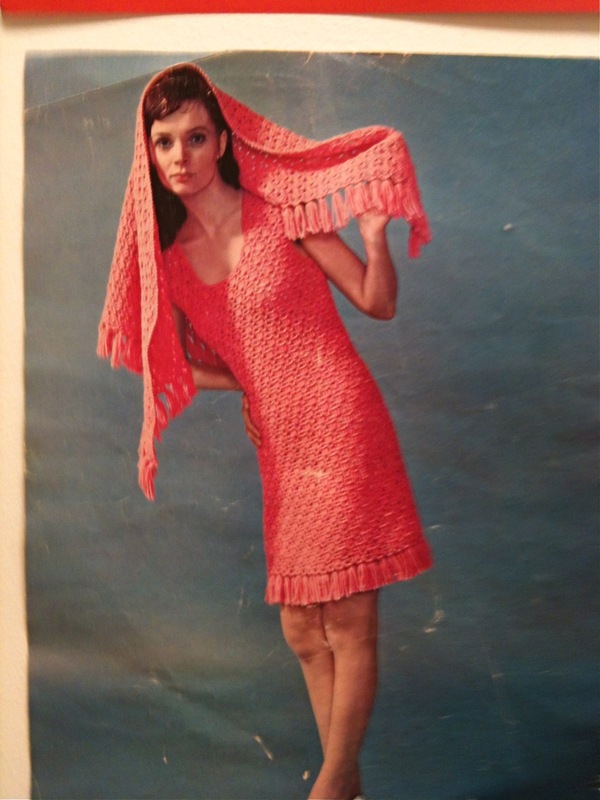 What about knitting conventions and retreats, the proliferation of knitting designs, books and classes. With all the yarn bombing and knitting in public how could she have missed the recent explosion in knitting. I was about to say, "You're kidding, right?" But then I realized that she was serious, and I bit my tongue. We moved on to chat about other topics. Later when I was mulling over our conversation, I thought maybe I don't get out enough. Or maybe I don't get out amongst non-knitters enough. I go to numerous knitting and fiber-related events. Many of my closest friends are knitters. In my world knitters are everywhere, but in the world at large we're still a small slice of the pie. Knitting in public can put things in perspective. My convention center knitting was quite productive. 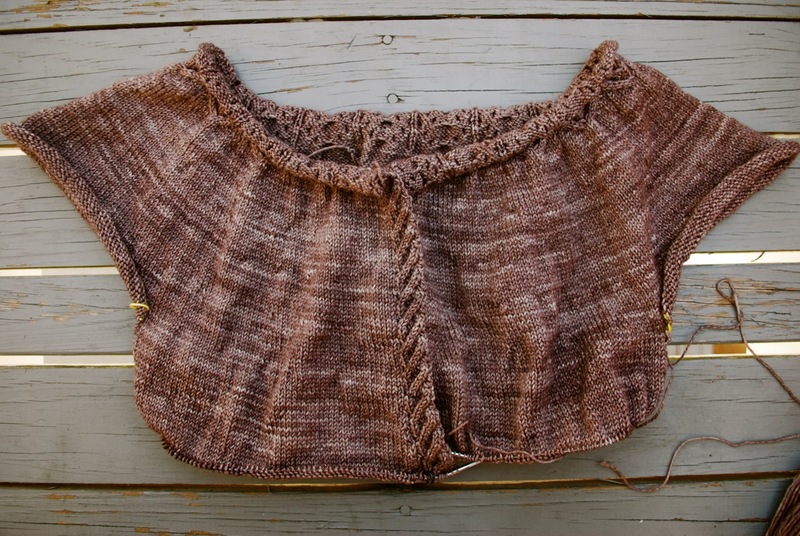 I was working on Alys, a top down sweater with a bit of cable trim. It may not look like much, but again it's all about perspective. I finished the cozy, cable trim and moved on to the stockinette section. I'm settling in with this project. 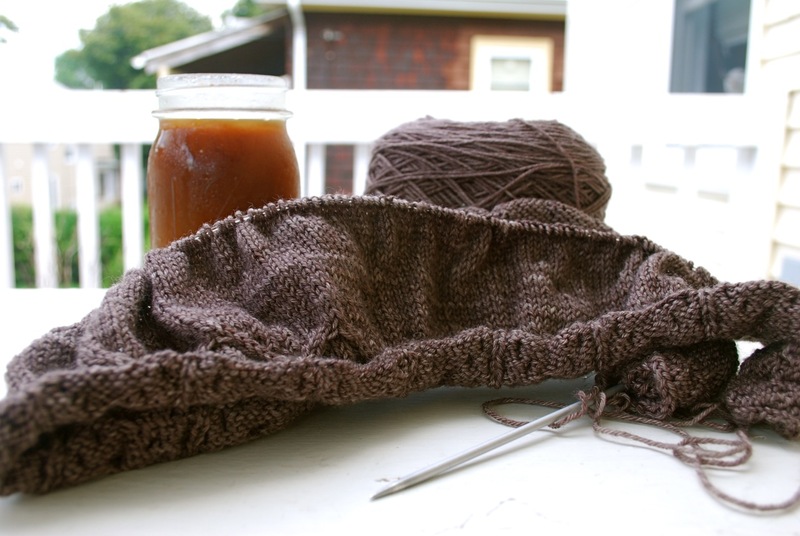 I have miles and miles of stockinette ahead.